Every one like this recipe much,in the evenings when we see near chatbhandars,they are overcrowded by people eating paani puris etc etc..I like the dish,but donno how safe is the paani he gives with the puris.Thanks all TV relaying stations who are relaying cookery related half an hour programmes ,relaying new varieties and various dishes by chefs,competitively..So this is the recipe i got it from the tv..Just try it,its yummy surely u will have a hygenical and safe paani puri at tea time..
Add water and knead the dough as for we do for chhappathis and set aside.. 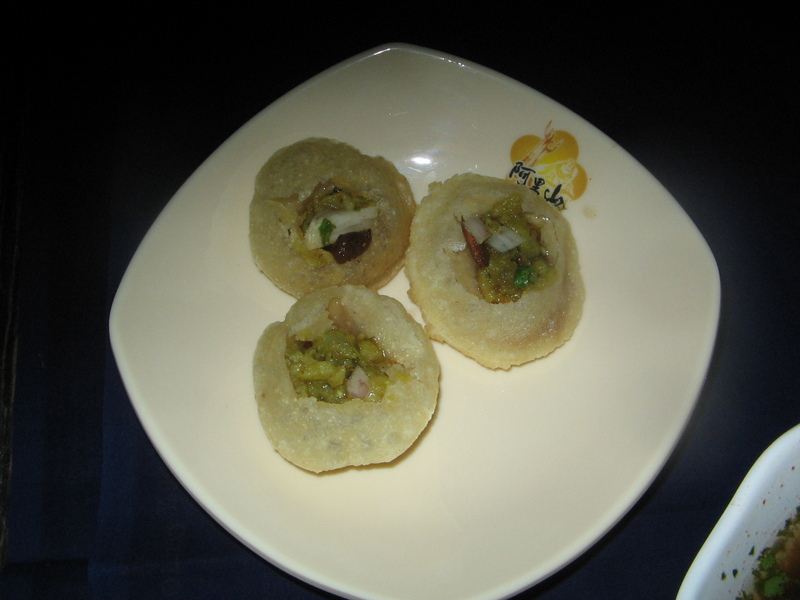 Mix maidha,and upma ravva with salt and oil,add water and knead well as of puris and keep aside. Then boil aloo and green peas,peel off aloo and keep aside. Place a pan on the stove add 2 tbsp oil ,after the oil is heated add mustard and jeera ,after they splutter add mashed aloo and boiled green peas and mix well. Now add dhania powder,salt,finely chopped kothmeer and amchur and saute well. Switch off after it is done.Keep aside. Now prepare paani,add 1/2 litre filtered water in to a vessel.Now add tamarind and extract the juice ,and throw the leftover remnants of tamarind. Now add salt,chilli powder,chaat masala,finely chopped onion,pepper powder,and 1 tbsp paste of mint,green chilli and jaggery or sugar, kothmeer leaves to the water and mix well.Lastly add finely chopped tomato pieces ,and keep aside. 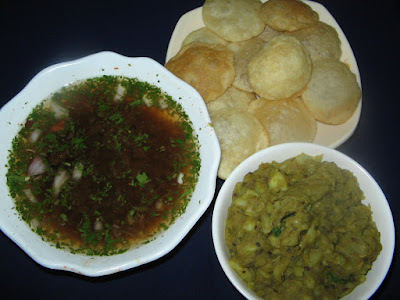 .Now take off a small portion on one side of the puri and stuff the curry (1/2 tsp)in to the puri and pour 1 tsp paani in to it.Now to enjoy the taste of it,put the small puri with curry and paani into ur mouth and enjoy the taste..
yummy and mouth watering panipuri. firt time here...u hv an awesome space..vist me as per ur convenience.. Thanks all a bunch of stopping by my space and passing sweet comments..